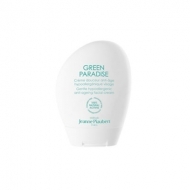 Green Paradise - Démaquillant 3 en 1 is a Jeanne Piaubert 3-in-1 cleanser to purify and soften the most fragile and sensitive skin. This hypo-allergenic paraben and fragrance-free formula was especially developed with 100% of carefully selected natural active ingredients to meet specific needs of more sensitive and reactive skins. It removes impurities, toxins and makeup residues providing superior comfort and softness. Use everyday A.M and P.M. To eye, face and decolette.